There is every temptation to describe the music at Tanglewood on Friday as autumnal. Contained within the prelude concert and the main event were works by musical giants (Schubert, Mozart, Mahler) —three from the ends of the composers’ lives. Yet with one notable exception, the performances possessed such merit and promise that one left with a spring-like optimism rather than resignation. The soloist at the Koussevitzky shed on this evening was a pianist who takes a particularly refined and serious approach. Jonathan Biss’s records almost exclusively works of major German/Austrian repertoire, being now in the midst of a complete Beethoven sonata project. His accomplished writing includes a perceptive and popular Kindle e-book (Beethoven’s Shadow), and an online course on Coursera, “Exploring Beethoven’s Sonatas.” Something about him suggests the intellectual intensity of Alfred Brendel, but Biss’s is writing is far less imperious, and his playing more colorful and varied. Most of Mozart’s late work is undeniably beautiful, but it bears a distinct quality that leaves many of us uncomfortable. I have seen it described as Apollonian, or spoken about as part of a withdrawal from the world. There’s a temptation to read prefigurings of Mozart’s death. I often find it aloof and distant, lacking effervescence. Thus, the hearing the first movement of Mozart’s valedictory Piano Concerto No. 27 in B-flat, K.595 played with an edge and animation surpised me. 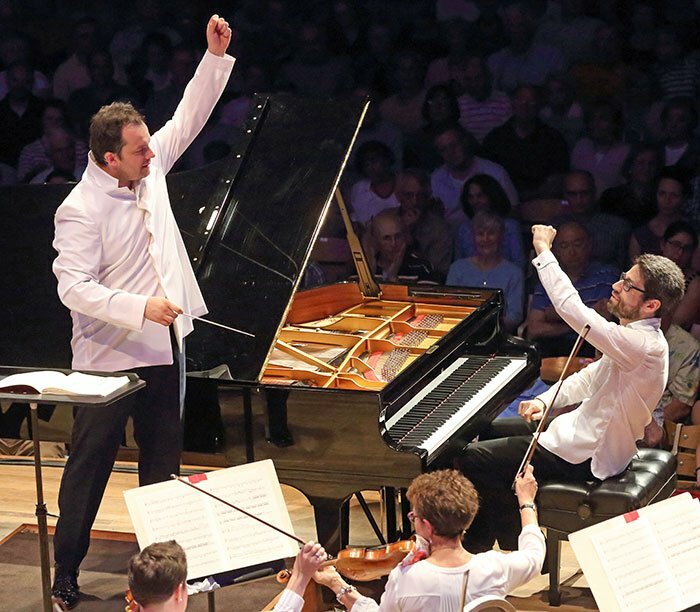 Andris Nelsons allowed the winds to bite in their fanfares, and Biss’s first entrance sounded powerful enough that I thought it had been embellished by the pianist. A later review of the score showed all those “extra” notes written out by Mozart; Biss simply invested them with a direction that gave them something more than decorative value. Biss regularly pushed the passagework forward, speeding up as the note values shortened, giving a flash of virtuosity as well, giving the movement a restless and inventive and immediacy. It is possible Biss and Nelson’s simply weren’t quite agreed about tempo: if so, their fluid negotiation gave the performance life. Those who were seeking more typical late Mozart would have been better satisfied with the two following movements. They unrolled with the impeccable taste and lyrical touch I expect from Biss, and with sensitive, deferential orchestral support. Although not the most rigorously coherent presentation, it engaged intellectually as a demonstration of craftsmanship. Nelsons and the orchestra have played Mahler’s Ninth many times now, and with the performance Friday I feel confident that this relationship between conductor and orchestra has the potential to be as fruitful and productive as any other in recent memory. This was maybe hinted at by Nelsons himself, who took the microphone after intermission to offer a rambling but heartfelt tribute to the orchestra, and to this piece, which was the first they played together. He then led a deeply emotional but never hysterical reading whose best qualities were clarity, control, individual beauty of performance in solo passages and profound depth and commitment in the massive tuttis. The music of the opening pages unfolded with dramatic spaciousness, and one could map the entrances clearly with one’s eyes closed. The infinite, extended, final pages were almost excruciating. One wondered at their fragility, as the notes hovered on the edge of audibility. This fragility emanated from a strong, confident center, though its ever-quieter letting-go, was hardly an etiolation of strength. It was almost as if the orchestra were simply moving away from us, not weakening. The close connection between orchestra and conductor was palpable in the many loud and crashing moments as well; while the Ländler of the second movement might have been a bit too deliberate for my taste, it allowed the contrasting sections, featuring a big elbow-throwing theme that screams down more than an octave, to move at an exhilarating pace that was sure-footed even as sped along. Even the Rondo-Burleske, a dense showcase of counterpoint and sour attitude, generated enough bad-tempered majesty to inspire premature applause from the lawn for its big finish. This may be music of death and endings, but for this conductor and orchestra, it augured a productive and optimistic future. In the earlier Prelude concert, Biss paired with Paul Lewis in the Schubert Fantasia, D. 940, for piano four-hands. As fantasies go the Schubert is fairly rigorous, and is organized as a union of four attaca movements bound together by a profound and melancholy opening theme which also dominates the finale. In between comes an intense Largo dominated heavily rhythmic figures: the page bristles with double- and triple-dotted notes and a triple-time scherzo. In Biss’s and Lewis’s hands the first theme became an extended study of the potentials. Each time it appeared they sculpted and shaded it beautifully, especially (and a little surprisingly) in the last movement, where its regular re-occurrence always came with some new color or emphasis. This uniformly beautiful playing perhaps over-prolonged the scherzo; one might have wished for something other than beauty to animate its repetitions. Lewis and Biss provided such a luminous collaboration that I cannot lay much blame on Lewis for the mess which followed. Lewis sat among three players from the BSO (violinist Victor Romanul, violist Michael Zaretsky and cellist Mickey Katz) for a performance of the Mozart Quartet K. 493 that was so ill-conceived and poorly prepared that it failed even to reach a level called perfunctory. Lewis managed to achieve brief moments of glowing passagework—he alone seemed committed to the work—but even he had moments of clumsiness, perhaps provoked by choices made by the other players. The problems were clear from the initial attack, where the string balance was odd and the sound thin. Romanul was frequently out-of-tune, and played with a rubato so extreme that it suggested sloppiness, not expression. Zaretsky seemed to be able to follow Romanul, but in their parallel passages he produced an acid tone. Katz distinguished himself among the strings by playing simply and staying out of the way of the piano. Certainly no serious discussion of interpretation had occurred, or at least nothing had been agreed upon. It’s not likely that the BSO intends that the Preludes be seen as any less important and less polished than the subsequent shed concerts; some quality control is needed to prevent this kind of thing from occurring again. We have all had the unpleasant experience of enjoying a concert, only to read a review of it that seems to mock not only the artists who performed, but the very things about them that made the performance so special. I left this prelude concert deeply moved and full of admiration for my colleagues [Horowtiz plays violin II in the BSO]. Mr. Romanul’s timing and rubato were poetic and completely in tune with Mr. Lewis; his technical command was unquestionable. I took special pleasure in the fact that his concept was challenging and original, in an age when one has so often to settle for mere correctness. If this reviewer continues to put forth the idea that the BSO lacks quality control, I can say with assurance that he will find himself in a distinct minority. That the hours of care and thought that go into each and every performance were lost on him, is his loss. Unfortunately I have to agree with the reviewer about the prelude concert. It actually felt as though the string players were sight reading. They were simply never together. This isn’t a matter of taste or skill at all – they simply just sound unprepared and unrehearsed. Even adventurous playing needs to be focused and crafted. I’m glad you enjoyed the Mozart so much, though. I think it’s more a testament to Mozart’s skill than the actual playing. Having spoken to a few musicians at the concert, we seemed to have all been in agreement, too.